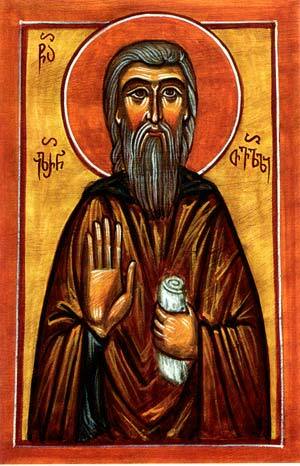 Saint Hilarion of Tvali (Tulashvili) served as abbot of Khakhuli Monastery in southwestern Georgia at the beginning of the 11th century. In his work The Life of George of the Holy Mountain, George the Lesser writes that Venerable Hilarion was outstanding in virtue and celebrated for his sermons and ascetic labors. St. Hilarion raised the young George of the Holy Mountain to be a brilliant writer, translator, theologian and patriot. From him George also received a blessing to enter the monastic life. According to the chronicle Life of Kartli, St. Hilarion was a famous translator and writer and an eminent theologian. Eventually St. Hilarion moved from Khakhuli to Tvali Monastery, not far from Antioch, where he remained for the rest of his life. According to the 19th-century historian-iconographer Michael Sabinin, St. Hilarion reposed in the year 1041.